From the world's leading organization of internal medicine physicians, ACP, in conjunction with McGraw-Hill, here is the Principles and Practice of Hospital Medicine book, the hospitalist's definitive guide to the knowledge and skills necessary to practice Hospital Medicine. Presented in full color and enhanced by more than 700 illustrations, this authoritative book provides a background in all the important clinical, organizational, and administrative areas now required for the practice of hospital medicine. The goal of the book is provide hospitalists, including trainees, junior and senior clinicians, and other professionals with a comprehensive resource that they can use to improve care processes and performance in the hospitals that serve their communities. Each chapter opens with boxed Key Clinical Questions that are addressed in the text and hundreds of tables encapsulate important information. Case studies demonstrate how to apply the concepts covered in the text directly to the hospitalized patient. 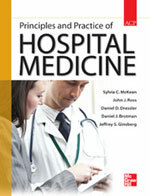 View the Complete Table of Contents or Sample a Chapter. Systems of Care: Introduces key issues in hospital medicine, patient safety, quality improvement, leadership and practice management, professionalism and medical ethics, medical legal issues and risk management, teaching and development. Medical Consultation and Co-Management: Reviews core tenets of medical consultation, preoperative assessment and management of post-operative medical problems. Clinical Problem-Solving in Hospital Medicine: Introduces principles of evidence-based medicine, quality of evidence, interpretation of diagnostic tests, systemic reviews and meta-analysis, and knowledge translations to clinical practice. Approach to the Patient at the Bedside: Details the diagnosis, testing, and initial management of common complaints that may either precipitate admission or arise during hospitalization. Hospitalist Skills: Covers the interpretation of common, low-tech tests that are routinely accessible on admission, how to optimize the use of radiology services, and the standardization of the execution of procedures routinely performed by some hospitalists. Clinical Conditions: Reflects the expanding scope of hospital medicine by including sections of Emergency Medicine, Critical Care, Geriatrics, Neurology, Palliative Care, Pregnancy, Psychiatry and Addiction, and Wartime Medicine. You can also call ACP Member and Product Support at 800-523-1546, extension 2600 or 215-351-2600 (M-F, 9 a.m.-5 p.m. ET).